Once considered one of the blander-looking planets, Uranus (pronounced YOOR un nus) has been revealed as a dynamic world with some of the brightest clouds in the outer solar system and 11 rings. The first planet found with the aid of a telescope, Uranus was discovered in 1781 by astronomer William Herschel. The seventh planet from the Sun is so distant that it takes 84 years to complete one orbit. Uranus, with no solid surface, is one of the gas giant planets (the others are Jupiter, Saturn, and Neptune). The atmosphere of Uranus is composed primarily of hydrogen and helium, with a small amount of methane and traces of water and ammonia. 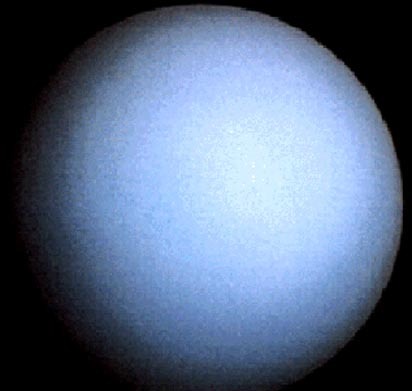 Uranus gets its blue-green color from methane gas. 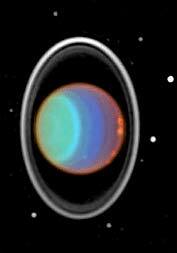 Sunlight is reflected from Uranus' cloud tops, which lie beneath a layer of methane gas. As the reflected sunlight passes back through this layer, the methane gas absorbs the red portion of the light, allowing the blue portion to pass through, resulting in the blue-green color that we see. The planet's atmospheric details are very difficult to see in visible light. The bulk (80 percent or more) of the mass of Uranus is contained in an extended liquid core consisting primarily of 'icy' materials (water, methane, and ammonia), with higher-density material at depth. In 1986, Voyager 2 observed faint cloud markings in the southern latitudes blowing westward between 100 and 600 kilometers (60 and 400 miles) per hour. In 2004, the Keck Observatory in Hawaii used advanced optics to capture highly detailed images of Uranus as the planet approached its southern autumnal equinox, when the equator will be vertically illuminated by the Sun. Uranus' rotation axis is nearly horizontal with respect to the ecliptic plane, the imaginary plane containing Earth's orbit, as well as the orbits of most of the planets, as though Uranus had been knocked on its side. This unusual orientation may be the result of a collision with a planet-sized body early in the planet's history, which apparently radically changed Uranus' rotation. Additionally, while magnetic fields are typically in alignment with a planet's rotation, Uranus' magnetic field is tipped over: instead of aligning along the rotational axis, the magnetic axis is tilted nearly 60 degrees from the planet's axis of rotation, and is also offset from the center of the planet by one-third of the planet's radius. Unlike the magnetic fields of Earth, Jupiter, and Saturn, which can be thought of as acting like dipole bar magnets, the fields of Uranus (and Neptune also) are very irregular. Uranus' magnetic field is about 48 times more powerful than Earth's. Even though Uranus is tipped on its side and experiences seasons that last over 20 years, the temperature differences on the summer and winter sides do not differ greatly because the planet is so far from the Sun. Near the cloud tops, the temperature of Uranus is -216 degrees Celsius (-357 degrees Fahrenheit). The Hubble Space Telescope photographed a new pair of rings around Uranus and two new, small moons orbiting the planet. The largest ring is twice the diameter of the planet's previously known rings; the rings are so far from the planet that they are being called Uranus' "second ring system." One of the new moons shares its orbit with one of the rings. 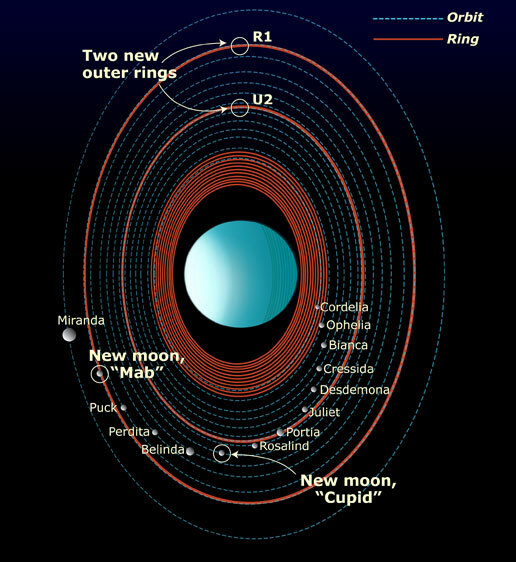 Analysis of the Hubble data also reveals the orbits of Uranus' family of inner moons have changed significantly over the past decade. Because of the planet's unusual orientation, Uranus' rings are perpendicular to its orbital path about the Sun. The 10 outer rings are dark, thin, and narrow, while the 11th ring is inside the others and is broad and diffuse. Uranus has 27 known moons, named mostly for characters from the works of William Shakespeare and Alexander Pope. Miranda was named after the daughter of the magician Prospero in Shakespeare's play The Tempest. By Comparison: If you weigh 100 pounds on Earth, you would weigh 86 pounds on Uranus.